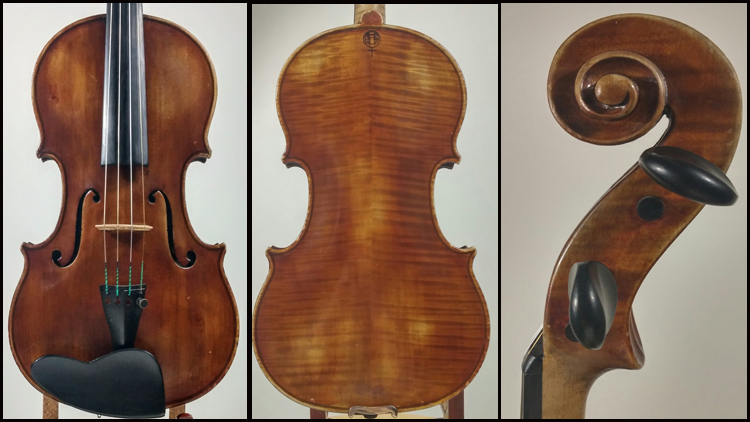 Violins over $10,000 — R.L. Ray Violin Shop, L.L.C. Please call the shop or follow the "Enquire," buttons below to contact us and arrange a viewing of any instruments which catch your eye! Born in Mirecourt, France, Amédée Dieudonné began his violin making apprenticeship with Gustave Bazin at age 14. Five years later, he began work in Brussels with the Darche firm. Amédée would eventually move back to Mirecourt to establish his shop in 1920. He was a prolific maker who built instruments for several firms, including Rudolph Wurlitzer, Moennig, Blanchard, Laberte, Mangenot, and Millant. Archibald Sommerville Hill was an Australian-born maker who emigrated to the United States in 1893. Hill learned his trade in Chicago, New York, and Toronto before opening his shop his shop in Seattle around 1922. He eventually moved East of the Cascades and settled in Yakima in 1960. Not only does the instrument have a powerful, open sound across all registers, it comes outfitted with a case and the original bow made by Archibald to accompany the violin.